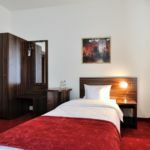 Rooms, services Hotel Centrum Sosnowiec is offering 28 tastefully furnished rooms to those seeking accommodation in Sosnowiec. You are free to bring a four-legged friend along, the hotel also allows small pets during the stay for an extra fee. The hotel is happy to have you in the restaurant for a hearty lunch or a romantic dinner. The hotel has an own parking lot, enabling you to park your car on the spot for an additional fee. In some of the rooms air-conditioning is in operation, ensuring that you will be feeling good also on warm summer days (please make sure on the information sheet of the selected room). If you have a suitable portable device, you can connect to the Internet via a wireless network (WiFi) available at the hotel. 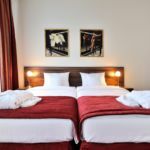 The exact scope of services offered by Hotel Centrum Sosnowiec (including those for an extra fee) and the exact equipment of a room are available on the information sheet below and on the information sheet of the given rooms. Payment The following methods are available to pay the reservation: cash, debit/credit card. Arrival, opening hours The earliest arrival time is 14:00, the latest time to leave the rooms is 12:00. The personnel speaks English and Polish.